This little book - my version is barely 160 pages - written by one of the vice presidents of Navigators, Jerry Bridges, holds in its few pages some pretty big ideas regarding what it is to walk with Jesus. Jerry Bridges passed away last year - and while I'm sure his greatest gift to those who knew him well was not this book - but rather the conscious life-choices that became the soil out of which this book grew. With millions of copies in print - this is one of the better known books that crosses faith-lines easily and seems to be growing - not slowing in influence. "As my emotions subsided, my anger turned to utter discouragement. It was onlyl 8:30 in the morning and my day was ruined. Not only was I discouraged - I was confused. Only two hours before I had read Paul's emphatic declaration, "For sin shall not be your master, because you are not under law, but under grace." But despite this nice sounding promise of victory over sin, there I was locked in the vise-like grip of anger and resentment." Reading these words - I was positive that Bridges had been peeking in on my house - where I rented a shared room from a campus ministry, sharing the single bathroom with 4-5 other women all scrambling at the last minute to get out the door to class every morning. I had nearly the same experience as often as not - of composing myself in my prayer and Bible study - only to fly out the back door with that composure lost. Okay - can we just stop for a moment and acknowledge that the whole topic of sin is still dicey. We want to do it less - but not live riddled to uselessness with guilt, we want to strengthen our ability to live free of it - but not become so inflated with legalism and self-righteousness that we poison the communities that we love. Sin is one of those conversations Christians can have - which when spoken of in earnest - compels us to stretch ourselves to the heights of theology, discipleship and philosophy. Sin is that many-disguised thing that knows all of our buttons and plays whack-a-mole on them. Sin is also that awful thing in us that toys with and rationalizes getting away with this or that "just this one time." For me - this book was a wonderful first-tool to go into my tool-box as a young Christian university student - and Bridges' love of godliness and gracious pursuit of it greatly encouraged me. If my review of this book falls short of imparting that sense in you (and it very probably will) - don't hold that against the book. Now -back to the book. Bridges divided this hefty topic regarding which millions of pages have been written - into 17 chapters - each centered around a different Scripture promise, principle or precept regarding sin. Considering his conciseness - and the fact that that total page count includes an author bio, forward, preface and afterward - he devotes a mere average of 8 pages to each of these chapters. What I'm saying in all this - is this little book will not waste a single second of your precious time. 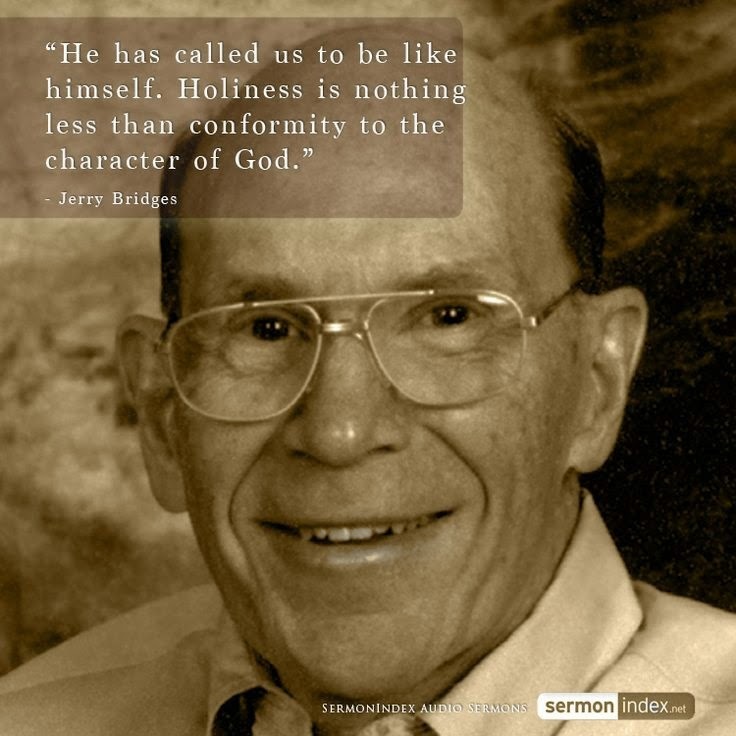 Bridges published this book when he was 49 - but you can sense the years of experience behind his own Pursuit of Holiness and the maturity behind his own walk shines through as he deftly divides the common pitfalls that can occur so easily in these conversations. Bridges lays out three primary problems that we must face when we think about growing to maturity - which of course means tackling our sinful nature. First: our attitude toward sin is more self-centered than God-centered. Second: we have misunderstood "living by faith" (Galatians 2:20) to mean that no effort at holiness is required on our part. Third: we do not take some sin seriously. The changing fashions in language and Christian writing might or might not fog the truth of these words - but for me they certainly still ring true. From this discussion Bridges launches into chapters defining and clarifying God's Holiness for us, how our holiness - even if we could attain it - would still as one Christian from by-gone centuries said - "even our tears of repentance must be washed in the blood of Christ!" and the Holiness of Christ. The ideas in these chapters brighten and illuminate just what is meant by holiness. Bridges then moves on to break down in a theologically tight but encouragingly vulnerable discussion on what it looks like for sinful man sanctified by the sacrificial act of the Lamb of God to redeem us to our Heavenly Father - to transfer citizenship from the kingdom of the earth to the kingdom of heaven. Again - he begins this chapter with an utterly relatable statement of the facts. "Having experienced failure and frustration with our sin problem, we are delighted to be told that God has already done it all that we only need to rest in Christ's finished work. After struggling with our sins to the point of despair, this new idea is like a life preserver to a drowning man, almost like hearing the gospel for the first time"
Bridges talks honestly about how easily we become "confused by Satan on the issue of what God has done for us and what we must do for ourselves." The rest of the book lays out the battle that ensues upon our conversion - and all the parts of that fight - the help that God offers, God's preference to speak of our obedience instead of the notion of "victory", how we must put sin to death, the role of personal discipline, and outlines three areas in which we must pursue God's holiness - namely in our bodies, our spirits and our wills. Once upon a time I re-read this book yearly - and after re-reading it for the first time in a while - I'm thinking that may not be a bad habit to return to for a season at least. This book has remained near and dear to me for a long time - as this was the very first book I read in the context of discipleship. I started reading it over my junior year at Michigan State with a campus ministry worship leader named Lauren. In typical fashion (for Lauren - not me) we read through this book a chapter at a time over the course of more than one 10-week term; and we read every last word of it. Some of you who know me know that I never really outgrew that ability we have when we're younger to tire people questions - and no one has ever endured that quite like Lauren. We ended up discussing the material in these chapters over the course of two to three hours some evening - sitting in her basement opposite ends of her couch - with her dogs and cat not far away. I'm not sure what led her to choose this book - but by the time we read through it together it had already been in print for over a decade and still showed no signs of losing traction. In fact it's still in print - with renditions and updates. This is one of those books that I have bought and gifted so often - that I lose count. There are books that "belong to their time" - and there's nothing wrong with that - but I'm especially interested in those books on chasing after God which ring true decade after decade and are not written because of their market-ability - but because of their inherent spiritual value. While other books by Jerry Bridges are available through our local library - this one is not - though you can obtain it (with a little more patience) through inter-library loan outside of the Winding Rivers system. That said - it's an inexpensive book - I'm happy to loan mine out again too. May 16, 2017 /JC's Village C.C.M.